Ultrasonic Low-Frequency Short-Pulse Transducers with Dry Point Contact.Development and Application. Low-frequency transducers with dry point contact (DPC) allow to overcome the problems of ultrasonic contact in testing the concrete. DPC transducers make it possible to test the concrete and other solid materials both with longitudinal and shear waves. There is stated the operation principle and description of ultrasonic low-frequency short-pulse piezo-electric transducers with DPC (these transducers can generate normal and tangential oscillation forces on the solid body's surface); given the directivity diagrams of transducer's acoustic fields, signal's waveform and spectrums; shown the possible areas of application for these transducers, in particular - flaw detection of concrete structures by pulse echo-method and testing of strength and other properties of materials and products. 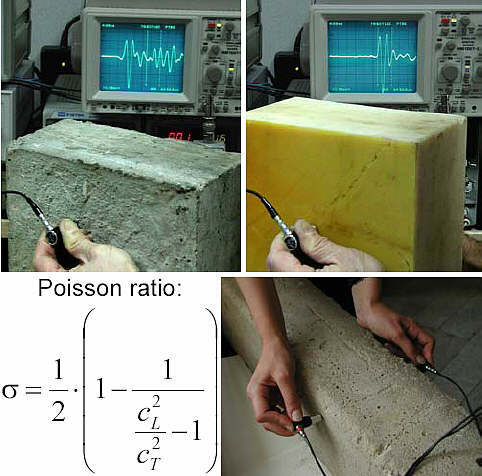 The ultrasonic testing of concrete and ferroconcrete is possible on the frequencies not more the 150 - 200 kHz. Rough, often undulating and porous surface of concrete structures demands special and laborious preparations for achieving the acceptable quality of acoustic contact through the liquid. Testing of the concrete with through-sounding method and more over surface sounding needs the knowledge of the base of sounding with the possible more exactness. To reach that the sizes of probe operating surface should be decreased to the limit. When testing the concrete with the echo method the space selection of the reflector is needed, that can be achieved with the help of big wave size probe or with the help of synthetic aperture focused technique (SAFT). SAFT assumes the usage of small wave size probe. Besides for some purposes, that can be served both with the sounding method and echo method, the transducers with a short duration of transformable impulses and with a low level of self reverberation noise are needed. All these conflicting objectives to ultrasound transducers for testing of the concrete were successfully satisfied by invention of the low-frequency transducer with dry point contact (DPC). The essence of the DPC is: the size of the acoustic contact zone of oscillating probe surface with the surface of the test object is many times smaller than the length of the ultrasound wave. So when the wavelength is 40 mm (the typical value of wavelength while testing the concrete with ultrasound) the contact with the size of the zone less then 1 - 2 mm can be considered as point contact. In this case the contact liquid makes no influence on the coefficient of signal transformation and became useless. The transducer acts on the test object surface as a point oscillating force. The principle of DPC is already known for a long time and is used in different low-frequency ultrasound devices [1, 2]. For testing the concrete structures the low-frequency transducers with half-waved concentrator are used . The concentrators are the resonant elements that collect oscillations of rather big aperture of transducer in the point of contact. Our low-frequency transducers with DPC differ from the transducers with concentrators by the three main specialties. First, the size of the element that sends the oscillations from the piezo-element to the wear tip is many times smaller then the wavelength. Second, the sizes of the piezo-element in the plane that is parallel to the plane of the test object surface is not less then in 1.3 times thinner then the size of piezo-element, that is equal to the half of the wavelength in its material. Third and final, the damper of the probe that is made from the liquid composite material with higher oscillation attenuation,surrounds the whole free space of piezo-element. 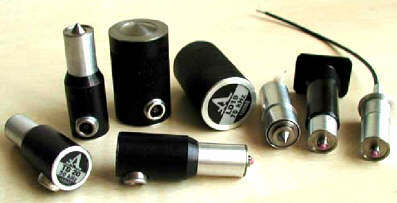 Fig 1: Ultrasonic DPC transducers: 1 - wear tip, 2 - piezo-element, 3 -damper, 4 - hermetic baffle, 5 - commutator,6 - connector, 7 - cover. As the wear tip has small wave sizes, it oscillates as a concentrated body, almost without any deformation.As a result being aperiodic it doesn't distort the transmitted signal in contrast to a half-waved concentrator.The choice of the pointed above sizes of the piezo-element allows moving the frequencies of radial oscillations of piezo-element above the limits of the operation frequencies that means to make the frequency of the operating mode of piezo-element the lowest. That in combination with the effective damping provides the quick operating oscillation attenuation of piezo-element and of the self reverberation noises of the probe. The structure of the proposed low-frequency transducer is represented on figure 1. The transducer (figure1, a) produces the normal strains in the point of contact with a solid surface. It's piezo-element is for simplicity represented as two-plied, though there can be more plies in it. The signs "+" and "-" show the polarity of its constituent piezo-plates. At such polarity the piezo-element makes stress-strain oscillations longitudinally. The oscillation directions of the wear tip are indicated on figure 1 with the arrows. To achieve the transversal oscillations of wear tip that allow to create the shearing stress of the surface of the solid body, we proposed to set two piezo-elements symmetric to the center of the wear tip (figure 1, b). The polarity of piezo-plates that are the components of the transducer's piezo-elements, is chosen so, that by the injection of the equal (inphase) signals on the both piezo-elements they oscillate longitudinally antiphase. It is obvious, that the same structure of the transducer (figure 1, b) can be used for creation of longitudinal oscillations of the wear tip, like the transducer with one piezo-element (figure 1, a). To achieve that both piezo-elements should oscillate inphase while radiating, and while receiving they should produce in-phase electric signals at longitudinal offset of the wear tip. This way their sum will be the received signal of the longitudinal wave. Of course this can be achieved with the similar piezo-elements,this means that they consist of the similar (by the polarity) assembled piezo-plates. The transducer, which has two piezo-elements (figure 1, b), allows to control the directivity of the wear tip oscillations, if both of it's piezo-elements are similar to each other, and their lead-outs are independent.Then their in-phase stimulation produces longitudinal oscillations of the wear tip, and antiphase stimulation makes shear oscillations. For receiving the normal oscillations of material surface that are produced by the longitudinal waves, the signals from the piezo-elements are summarized, and for receiving shear oscillations of the surface (from the shear waves) - they are deducted. The needed phasing of piezo-elements in the modes of radiation and reception can be realized with the help of electric commutator that is built in the case of the probe. The experimentally received diagrams of directivity for the transducers with DPC are represented on figure 2. The diagrams show that the transducer with the longitudinal oscillations of the wear tip provides radiation and reception of longitudinal ultrasound waves perpendicular to the surface of the half-space. The transducer with the shear oscillations of the wear tip allows to radiate and to receive shear ultrasound waves perpendicular to the surface of the half-space. Fig 2: Directivity characteristics of DPC transducers longitudinal (a) and shear (b, c) oscillations of a wear tip: - shear waves; - longitudinal waves. Fig 3: Waveforms and spectrums of DPC transducers longitudinal (above) and shear (below) oscillations of a wear tip. As a result of the point acoustic contact besides the main type of waves each transducer on some angles to the surface of half-space inevitably radiates and can receive another type of volume waves (figure 2). Besides along the surface of the half-space from these transducers different surface waves are spreading to the different sides from the point of contact. The transducer with the shear oscillations of the wear tip is the non-directional radiator of the Rayleigh wave. The transducer with the shear oscillations of the wear tip radiates in the direction of displacement vector longitudinal subsurface waves and Rayleigh waves. In the perpendicular direction to the displacement vector it also radiates SH waves (with horizontal polarization). These characteristics of the transducer of shear oscillations make it possible to measure the velocity of the longitudinal and shear waves in materials with the method of surface sounding. The typical view of signals and spectrums of developed transducers are represented on figure 3.Oscillograms are recorded at the through sounding of the fluoroplastic sample with the diameter of 120 mm and thickness of 40 mm by the pair of the similar transducers.The sounding base is 40 mm.The upper oscillogram and the spectrum were received from the transducers with the longitudinal oscillations of the wear tip and the lower - from the transducer with the shear oscillations. Spectrumswere calculated on the intervals containing the received signals that are marked by the vertical lines.It's seen, that the signals of the transducer have only 1 - 2 periods of filling. The width of their spectrum is 60-70% of the frequency of maximum. Such short signals are the best way to approach for the echo-method of testing the concrete. The appearance of the transducers is shown on figure 4. The transducers can be used both as for the manual control and as the element of the antenna array. Fig 4: Appearance of DPC transducers. Due to it unique characteristics - low duration of the signal and the dry acoustic contact - the transducers can be used for solving a variety of purposes in low-frequency ultrasound testing. Fig 5: Tomogram of wall substructure with I-bar inside the concrete. On the base of the antenna array of the DPC transducers and of the SAFT is possible to invent the devices for flaw detection of the concrete structures with echo-method. The result of the concrete solid foundation testing of with one of these devices is represented on figure 5. This is a tomogram of type B that was received on the ultrasound tomograph A1230 . On the tomogram it is possible to see the track of the monolithed steel bar in the concrete. The resolving ability of tomograph is about 60 - 80 mm on the both sides of the datum lines. Its sensibility is enough for detection of holes in the concrete with the size of 30 mm and more. At the sizes of the coarse aggregate more then 20 - 30 mm tomograph allows detecting the holes, which size is 1.5 - 2 times more then the average size of the grain. Fig 6: Bottom pulses sequence in concrete wall. The usage of A-scan at testing the concrete with the echo-method allows to estimate the thickness, to detect rather big defects in the concrete and in some cases to detect the state of the border between the connected materials, for example between the concrete and the metal. On figure 6 represented the oscillogram of the echosignals from the concrete wall with the thickness of 180 mm that was received with the help of flaw detector A1220, developed in the Research Institute of Introscopy of MSIA "Spectrum". The oscillogram shows well some repeated impulses of reflection from the surfaces of the wall. Oscillograms on figure 7 illustrate the type of the echosignals at testing the quality of fixation of granite axle on the steel axis with the help of the concrete mass. Such axles are used by the paper production. Oscillograms are received from the three different points of the axle surface: The upper one is from the area where the connection of granite with the concrete is bad, the middle one - from the area of the good connection of granite casing with the concrete and of the concrete with the metal, and the lowest - from the area, where the fixing of granite and concrete is of the average quality and connection between the concrete and steel is bad. The bad connection between the concrete and the steel was detected by the phase of echo-impulse from the border concrete - steel. On the middle oscillogram, where this connection is good, is the contrary phase of the impulse. Fig 7: Echo-signals from bedding interfaces between granite and concrete (1) and between concrete and steel (2). The invented transducers allow easily and quickly to make flaw detection of different nonmetallic materials and to estimate their physical and mechanical characteristics measuring the velocity of longitudinal and shear ultrasound waves with the help of through sounding technique. 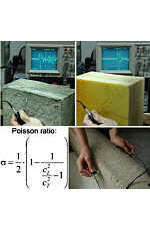 In particular with their help it is possible to estimate the solidity of the concrete or to measure the Poisson ratio. Figure 8 illustrates such testing of materials. The transducers with the shear oscillations of the wear tip allow to test the characteristics of the material and to detect the near surface defects with the help of the surface sounding. On their base was developed the ultrasonic tester UK1401 that is represented on figure 9. It allows measuring the velocity of the longitudinal waves in materials and to estimate the depth of surface cracks. Fig 8: Materials evaluation by through sounding technique. 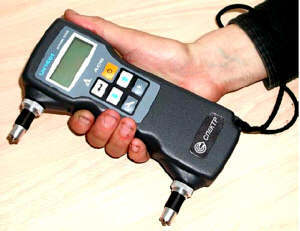 Fig 9: Ultrasonic tester UK1401. Short signals: 1.5 - 2 periods of oscillations. Quick attenuating self reverberation noise: more then 10 dB during one period of oscillations. Surface waves - head, Rayleigh and SH. Electric switching of wave types. Electric control of polarization phasor. Lange U. V. Low-Frequency Acoustic Methods and Facilities of Non-Destructive Testing for Multi-Layer Structures. Moscow: Machine- building, 1991, 272 p. (in Russian). Gluhov N. A. Point Generators of Ultrasound as an Instrument for Testing the Physic and Mechanic Characteristics of Materials // "Flaw detection", 1992, No. 8, pp. 49-51 (in Russian). Dzenis V. V. The Usage of Ultrasonic Transducers with Dry Point Contact for Non Destructive Testing. Riga: Zinatne, 1987. 260 p. (in Russian). Kozlov V. N., Samokrutov A. 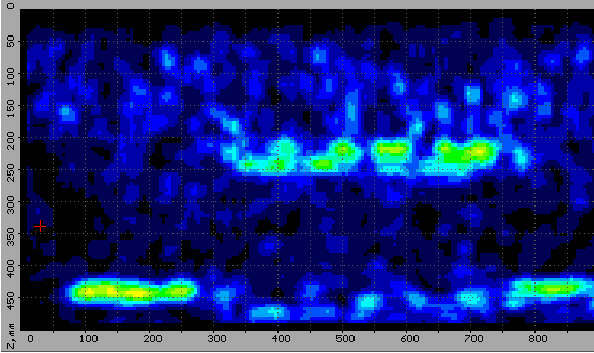 A., Shevaldykin V. G. Ultrasonic Low-Frequency Transducer. -Patent of RF No. 208163 - Bulletin of inventions, 1997, No.17. Shevaldykin V. G., Kozlov V. N., Samokrutov A. A. Inspection of concrete by Ultrasonic Pulse-Echo Tomograph with Dry Contact. 7th European Conference on Non-Destructive Testing.Copenhagen, 26 - 29 May, 1998.